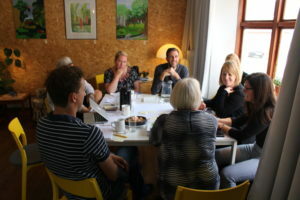 On October 9th 2018 Majken Toftager, RUC and Jesper Koefoed-Melson GivRum organized a workshop on co-creation with the local steering group in Viby. More people have become part of the steering group that now holds people from the local community centre, Kulturcosmos, the local library, youth club, an entrepreneur and an urban planner holding key responsibility for the strategic development of Viby. On the workshop it was discussed how to form more co-creation partnerships between municipality and local community actors. Furthermore the workshop focused on generating ideas for the event ‘Viby Folkefest’ in the summer 2019. The reflections and discussions raised will be further elaborated through workshops in the coming months.